We are delighted to announce that the Green Chemistry themed web collection based on presentations at the International Symposium on Green Chemistry 2017 meeting held in La Rochelle, France between 16th-19th May 2017 is now online. 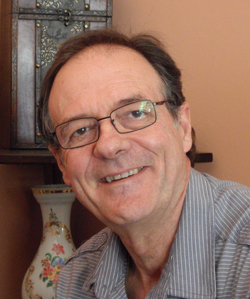 The web collection is guest edited by François Jerome (CNRS University of Poitiers, France). What are the greatest needs in green chemistry? Applied research in the area of green chemistry can be most effective if it is directed at solving problems that cause significant environmental impact or inefficiencies in current human activities. It is therefore necessary to identify those problems. Green Chemistry is planning a virtual special issue on the topic of the greatest needs for green chemistry research, in the hope that this information will be of service to the community. The issue will encompass Perspectives papers that identify the top green needs in any one area. Who would you recommend as the author(s) for the papers you’ve suggested above? We welcome self-nominations and proposals for Perspectives which fall into this topic. Please note that all papers will be subject to the usual initial assessment and peer review processes. Click through to read the Themed Collection online Molecular Design for Reduced Toxicity guest edited by Paul Anastas, Julie Zimmerman and Adelina Voutchkova-Kostal. Molecular design for reduced toxicity is an area of green chemistry which seeks to increase our understanding and enable the design of molecules across structural classes and applications that can provide the required functions, without the undesirable toxicity. Green Chemistry is pleased to announce the publication of the Lignin Chemistry and Valorisation themed issue. The Guest Editors for this issue are Professor Bert Weckhuysen (Utrecht University, Netherlands), Dr Pieter Bruijnincx (Utrecht University, Netherlands) and Dr Roberto Rinaldi (Imperial College London, UK). Recently, the scientific community has made significant progress in engineering lignin, characterising its structural features, valorising the biopolymer through catalysis, and finding new outlets for the lignin-derived products. The aim of this themed issue is to show the latest developments in the field of lignin chemistry and valorisation. Below are some high quality Open Access articles in the collection. You can view the full collection here. Issue 4 of Green Chemistry is a part themed issue on ‘Elemental Recovery and Sustainability‘ focusing on how we can develop methods to ensure that elements are available for use by future generations through sustainable use and recovery. The guest editors for this themed collection are James Clark (University of York, UK), Andrew Hunt (University of York, UK), Avtar Matharu (University of York, UK) and Alex King (Ames Labs, USA), read their editorial for free here. The outside front cover of the issue features the Critical Review “Bio-derived materials as a green route for precious & critical metal recovery and re-use” by Jennifer R. Dodson, Helen L. Parker, Andrea Muñoz García, Alexandra Hicken, Kaana Asemave, Thomas J. Farmer, He He, James H. Clark and Andrew J. Hunt. In this article they give an overview of research in critical and precious metal recovery using biosorption, application to real-life wastes and uses of the metal-loaded materials. The inside front cover of the issue features the Paper “Recycling of rare earths from NdFeB magnets using a combined leaching/extraction system based on the acidity and thermomorphism of the ionic liquid [Hbet][Tf2N]” by David Duponta and Koen Binnemans. In this article they describe how a new recycling process was developed to recover rare earths from roasted NdFeB magnets using the thermomorphic and acidic properties of the ionic liquid [Hbet][Tf2N] to achieve a combined leaching/extraction system. “Greening the global phosphorus cycle: how green chemistry can help achieve planetary P sustainability” by Paul J. A. Withers, James J. Elser, Julian Hilton, Hisao Ohtake, Willem J. Schipper and Kimo C. van Dijk. “Non-heme iron catalysts for epoxidation and aziridination reactions of challenging terminal alkenes: towards sustainability” by Anja Fingerhut, Olga V. Serdyuk and Svetlana B. Tsogoeva. “Reclamation of reactive metal oxides from complex minerals using alkali roasting and leaching – an improved approach to process engineering” by S. Sanchez-Segado, T. Makanyire, L. Escudero-Castejon, Y. Hara and A. Jha. “Chameleon behaviour of iodine in recovering noble-metals from WEEE: towards sustainability and “zero” waste” by Angela Serpe, Americo Rigoldi, Claudia Marras, Flavia Artizzu, Maria Laura Mercuri and Paola Deplano. To mark the occasion of Green Chemistry completing fifteen years of publication we invited contributions from authors who have had highly cited articles from each of the past 15 years. 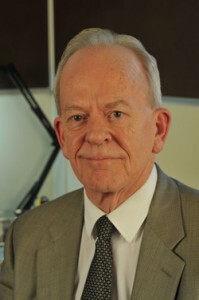 The result is a growing web collection covering topics of current importance in green chemistry from those who have contributed to developing the field. Details of the contributors, their highly cited article from the year they are representing, and their recent contribution are below. Two recent additions to the collection are from Professor Chinzia Chiappe (University of Pisa), and Dr Peter Dunn (Pfizer). 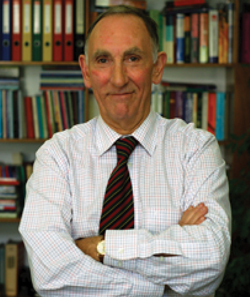 In 2007, Dr Dunn was the lead author on a Perspective article produced from the ACS GCI Pharmaceutical Roundable entitled ‘Key green chemistry research areas—a perspective from pharmaceutical manufacturers‘. His contribution to the 15 years of Green Chemistry collection is another Perspective with an Industrial theme ‘Pharmaceutical Green Chemistry process changes – how long does it take to obtain regulatory approval?’. All of these articles are free to access until the end of July 2014. The 15 Years of Green Chemistry collection will be added to throughout 2014 and you can access the articles by clicking on the titles below, or look at the full collection of recent articles online here. 2001 Mixing ionic liquids – “simple mixtures” or “double salts”? 2006 Are ionic liquids a proper solution to current environmental challenges? 2007 Pharmaceutical Green Chemistry process changes – how long does it take to obtain regulatory approval? 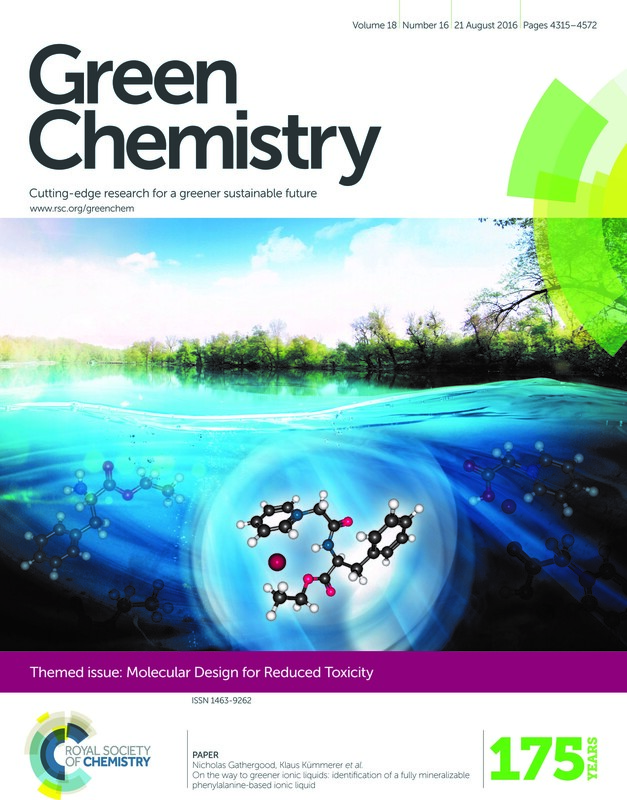 Green Chemistry Issue 4 of 2014 now online! Issue 4 of Green Chemistry is a part-themed issue on ‘Sustainable polymers: reduced environmental impact, renewable raw materials and catalysis’. Guest Editor Professor Michael Meier (Karlsruhe Institute of Technology, Germany) introduces the issue in his Editorial. This special issue is being published in collaboration with our sister journal Polymer Chemistry who will soon be publishing their issue on ‘Sustainable polymers: replacing polymers derived from fossil fuels’ Guest Edited by Stephen A. Miller (University of Florida, USA). 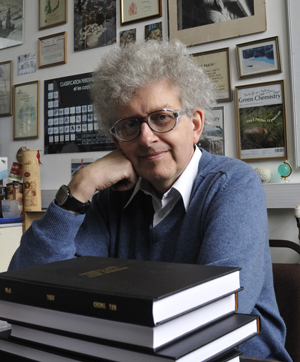 The two issues will be collated online – look out for the full ‘Sustainable Polymers’ collection later this month on our Themed Collections tab. 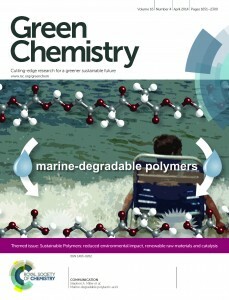 The outside front cover features the communication “Marine-degradable polylactic acid” by Ryan T. Martin, Ludmila P. Camargo and Stephen A. Miller. Mixing ionic liquids – “simple mixtures” or “double salts”? Keep up-to-date with the latest content in Green Chemistry by registering for our free table of contents alerts. 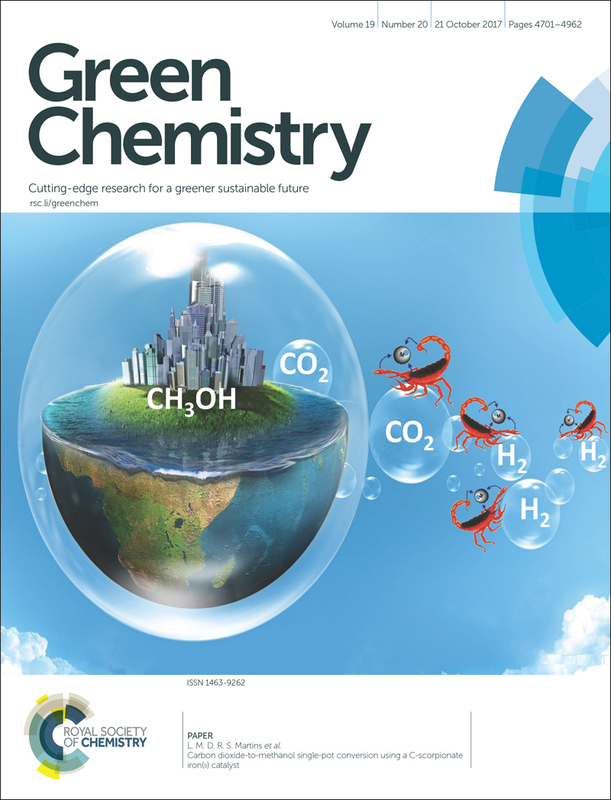 Issue 2 of Green Chemistry is a themed issue on the conversion of biomass with heterogeneous catalysts, Guest Edited by Professors Paul Dauenhauer and George Huber. It’s available to read online now. The front cover this month (pictured left) features a review by Jesse Hensley and co-workers from Golden, Colorado. In their article they focus on recent model compound studies of catalysts for hydrodeoxygenation of biomass pyrolysis products, with an emphasis on mechanisms, reaction networks, and structure–function relationships. The inside front cover this month (pictured right) features work by Andreas Heyden and co-workers from Columbia, South Carolina. In their work they report a theoretical study of the effects of various solvents on the mechanism of the hydrodeoxygenation of propanoic acid over Pd(111). Both of these articles are free to access for 6 weeks! 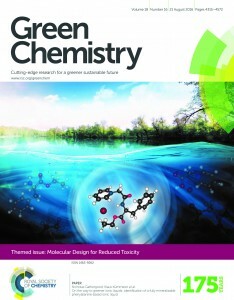 Accompanying this collection and further celebrating ‘15 years of Green Chemistry’ is an Editorial containing contributions from all of Green Chemistry’s Chairs of the Editorial board and Scientific Editors giving their views on the area of green chemistry and the changes they have seen since the Journal was launched in 1999… read the Editorial here. The 15 Years of Green Chemistry collection will be added to throughout 2014 and you can access the articles by clicking on the titles below, or look at the full collection of recent articles online here. The first issue of Green Chemistry was published in January 1999; as 2013 comes to a close we are celebrating the completion of 15 years of publication. Over these 15 years articles published in the Journal have recorded the evolving priorities in green chemistry research. To mark this significant milestone we invited past Chairs of the Editorial Board and Scientific Editors for their views on the area of green chemistry, and the changes they have seen since the Journal was launched. The result is a wonderfully thought-provoking Editorial which is published in 2014 Issue 1 and we hope you enjoy reading. 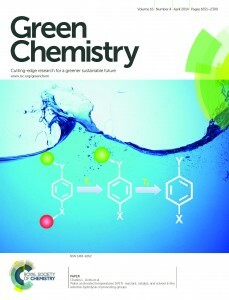 Read the Editorial celebrating 15 years of Green Chemistry online for free here. You are currently browsing the archives for the Themed Issue category.